One of the most critical pieces of global infrastructure is the intercontinental network of undersea fiber-optic cables. This communications network transmits daily approximately $10 trillion in financial transactions data throughout the global economy and is the vehicle for over 97% of all transoceanic information and telecommunications traffic, enabling worldwide Internet availability and other network services. Every day, the Society for Worldwide Interbank Financial Telecommunications (SWIFT) transmits 15 million messages between more than 8,300 banking organizations, securities institutions, and corporate customers across and within upwards of 195 countries worldwide. The low bandwidth and high latency of satellite data service make long-haul fiber-optic cables the only practical option for meeting current and future demand—at least for the foreseeable future. Modern communications require substantially more bandwidth than what telegram lines could offer in the nineteenth century. In order to transmit such a massive influx of data, undersea and terrestrial cables are now composed of fiber optics. Information and data are transmitted as light pulses, which are rapidly emitted through glass fibers across continental telecommunications lines and then between coastal landing stations as the signal travels across the oceans. Such long-haul transmissions also require periodic signal regeneration through amplifiers embedded in the cables’ couplers—where lengths of cable are joined together—to ensure that the signal does not dissipate before reaching its destination. The approximately 400 publicly disclosed undersea cable systems (both existing and planned) are mostly owned and operated by telecommunications companies. More recently, however, large Internet companies such as Google, Microsoft, and Facebook have entered this area as well. In 2014, Google partnered with five Asian internet and telecom companies to invest a total of $300 million to build the transpacific FASTER cable. More recently, Facebook and Microsoft announced a partnership to build MAREA, a transatlantic cable that will connect the East Coast of the United States to Spain. The United States, which is connected to approximately 60 licensed undersea cables, has extended only modest federal oversight of the industry. For several decades, the industry has consistently met the global market’s increasing demand for high-availability, low-latency, and high-bandwidth connectivity. The network has been—with occasional exceptions—remarkably resilient. While some aspects of the legal regime protecting undersea cables are well established, the legal protections at sea are not well-established and leaves open the potential for future attacks with little oversight and monitoring of the malicious party or recourse to hold it accountable. International treaty negotiations governing submarine cables date back to 1884, and the regime is now a part of the United Nations Convention on the Law of the Sea (UNCLOS). However, as submarine cables become increasingly critical to global infrastructure, the existing regime governing submarine cables has become increasingly neglected and requires greater interstate cooperation, as well as a review of the laws governing the protection of cables. Jurisdiction over and ownership of submarine cables can be unclear, generating uncertainty over the geographic delimitation of ownership—which could be done by following either the continental shelf or exclusive economic zone (EEZ) boundary lines. Furthermore, the existing legal regulations have not evolved to reflect the daily realities that now make undersea cables of vital importance throughout the global telecommunications network. These cables play a central role in finance, communications, and national security but this is not adequately reflected in international legal regulations and protections. While terrestrial cables and those within the jurisdictional waters of states fall under the regulation, protection, and control of the host nation, the regimes governing cables running through open seas are less clear. Nevertheless, a global consensus on the importance of international data and telecommunications infrastructure—dating back to the telegraph—has allowed for limited historical rule-setting. Of course, the existence of undersea communication cables long preceded the current massive network of fiber-optic lines. Following the establishment of early transatlantic cables, states attempted to devise a series of treaty obligations that would ensure the protection of these cables from tampering and disruption. As technology evolved over the decades, so have the legal regimes governing them. In 1884, 30 States adopted the Convention for the Protection of Submarine Telegraph Cables in order to better protect transatlantic communications. The convention establishes civil penalties for any act by a party “to break or injure a submarine cable, willfully or by culpable negligence, in such a manner as might interrupt or obstruct telegraphic communication, either wholly or partially.” As these cables were generally owned by the limited number of private telecommunications companies of the day, these companies (or potentially their sponsors) assumed responsibility for the maintenance of their cable lines and were held accountable for the disruption, cutting, or destruction of other undersea cables (art. 3–6). The provisions (and spirit) of the convention, however, clearly stipulated that it did not impose restrictions within areas of perceived state sovereignty, and that the application of the convention was limited to cables outside territorial seas (art. 1) and during times of peace (art. 15). The later recognition of the continental shelf as a new geographic extension of exclusive state rights beyond territorial waters required changes to the 1884 Convention’s recognition of a limit of 3 nautical miles to exclusive state jurisdiction. This change was particularly significant for cables that were buried in or laid on the seabed. No state, however, during the drafting of the Articles Concerning the Law of the Sea challenged the right of all states to lay submarine cables and to protect them subsequently. Despite the expansion of exclusive state jurisdiction, Article 4 in the Convention on the Continental Shelf stipulates that “subject to [a state’s] right to take reasonable measures for the exploration of the continental shelf and the exploitation of its natural resources, the coastal State may not impede the laying or maintenance of submarine cables or pipelines on the continental shelf” (art. 4). Similarly, the Convention on the High Seas disallows any state to “validly purport to subject any part of them to its sovereignty” (art. 2). This included ensuring the right of any coastal and noncoastal state to the “freedom to lay submarine cables and pipelines” (UNCLOS, art. 2). UNCLOS is an important legal document in the regime delimitating ownership and maintenance of undersea cable routes. The legal stipulations outlined in the 1958 Geneva Conventions on the Law of the Sea and some of the mandates within the 1884 Convention were either renegotiated, subsumed, or expanded for inclusion in UNCLOS. More importantly, it clarified existing provisions to make them compatible with changes to the regime on territorial waters, which now stretched to 12 nautical miles. Additionally, articles and clauses governing archipelagic waters and a nation’s EEZ were also included (art. 112). UNCLOS currently represents the legal baseline providing normative governance for undersea infrastructure. The United States, for example, has not ratified the convention, but generally regards its contents relating to traditional uses of the oceans as customary international law. There are limitations in UNCLOS, however, to cable-laying rights. There is a general obligation that activities related to undersea cables be conducted in “due regard for the interests of other States in the exercise of the freedom of the high seas” (art. 79). Operations within the EEZ or on the continental shelf of another state may be impeded if they interfere with the rights afforded to the coastal state by other articles of UNCLOS, such as those regarding the exploitation of natural resources. Cables in territorial waters also remain subject to the domestic legislation of the coastal state. A number of U.S. agencies manage, regulate, and exercise authority over the laying and maintenance of submarine cables within U.S. waters. Many U.S. states also have their own regulations for undersea cable placement and construction on their shores. Typically, the National Oceanic and Atmospheric Administration (NOAA) regulates the laying and placement of submarine cables near or around protected marine environments. During installation, NOAA may also coordinate with the Army Corps of Engineers, the Department of the Interior’s Bureau of Ocean Energy Management, the Federal Energy Regulatory Commission, or the Federal Communications Commission (FCC). It is less clear how domestic regulations and agency responsibilities merge to regulate ownership of undersea cables. Clear lines of responsibility and open lines of communication between agencies do not always exist. 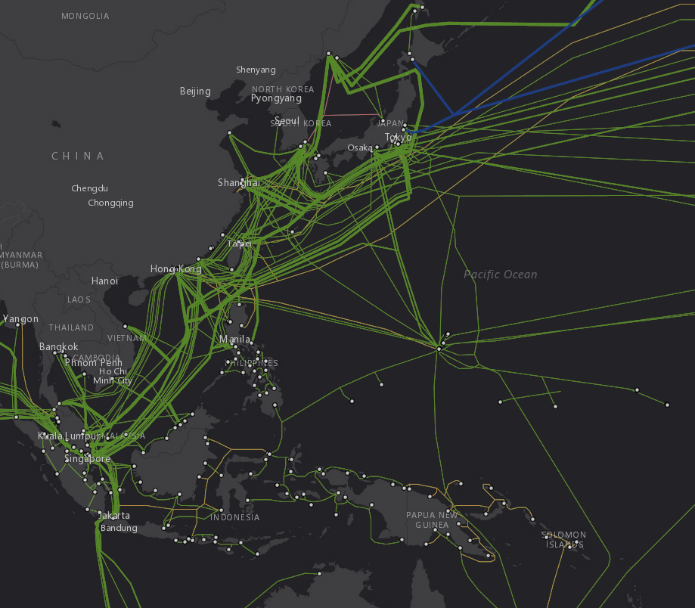 The U.S. Department of Defense lists the terrestrial landing sites of submarine cables as some of the most critical nodes of the United States’ infrastructure network, as they serve as points of connection to the global communications and economic arenas. Policymakers in the United Kingdom also view the protection of submarine cables as a vital national security concern and argue that the current legal status of the cables is not sufficiently clear. A number of scenarios place submarine cables at risk and endanger the security of cabled landing sites or the undersea routes. The three main categories of risk are a lack of network diversity, natural disasters, and human activity (both unintentional and intentional). One notable vulnerability of the existing undersea cable network is a lack of diversity in cable routes. This lack of diversity is dictated by a variety of limitations, including the cost and ease of permitting requirements, the topographic makeup of the seabed, the cost and ease of laying cables, and protections for marine environments. Often, landing sites are chosen based on the ease with which U.S. states allow such infrastructure to be built, and as a result cables become choked at one landing point. The overall cost and logistics of laying a new cable route also limit network diversity because owners typically elect to pursue known routes rather than pay to explore new options. Undersea cables are usually owned by a consortium of owners, which is responsible for costs associated with laying new undersea cables. The consortium model complicates financial responsibility for repairing the cable when it is damaged; more generally, it removes ownership—with all of its responsibilities and incentives—from the state. Finally, domestic regulations and permitting requirements aiming to mitigate ecological damage further restrict options for cable routes. Natural disasters, such as earthquakes, tsunamis, typhoons, and subsea landslides, pose significant threats to undersea cable networks. In 2006, a magnitude-7 earthquake in Taiwan damaged eight cables, disrupting data flow and communications from Taiwan to Hong Kong, Southeast Asia, and mainland China. The March 2011 earthquake and resultant tsunami in Japan similarly damaged half the transpacific cable network; however, redundancies allowed for communications traffic to be rerouted without major disruptions. 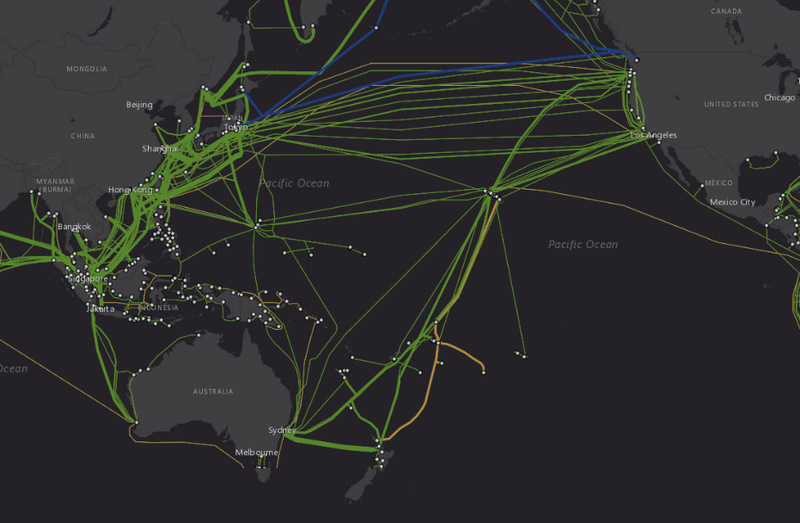 The risks are particularly glaring for less-developed island nations that may have only one cable connecting their territory to the wider network. In 2015 a typhoon was believed to have cut Mariana Island’s only undersea fiber-optic cable, resulting in a complete loss of communications with the outside world; financial services, such as credit cards and ATM machines; and telephone connections to emergency services. The most common cause of damage to undersea cables is human error and negligence. Problems arising from bottom-tending commercial fishing equipment and related dredging account for 40% of cable disruptions. Another 15% of damage is caused by anchoring incidents, such as improperly stored anchors, anchoring outside approved areas, sea conditions affecting anchor positioning, and the emergency dropping of an anchor. Other benign human factors include dredging and dumping, oil and gas development, offshore wind and energy development, hydrokinetic projects, ocean thermal energy conversion, deep-sea mining operations, and other renewable energy projects. The International Cable Protection Committee has issued a manual with recommendations aimed at mitigating damage to submarine cables due to human interference, error, and fishing activities. The potential for the sabotage of undersea cables during times of conflict or by transnational terrorism exists, but such incidents are historically rare. During Egypt’s massive internet outage in 2008, three cables were cut and the Egyptian Coast Guard caught divers trying to cut the fourth. In 2010, terrorists also cut cable lines near Cagayan de Oro in the Philippines. Thus, while activity targeting submarine cables is rare, a few notable historical examples exist.